I could get to the main page, but the links werent working... so I guess I wont worry for a while. [soapbox] There wasn't a link (yet) to purchase UP merchandise, and I know that they are changing how they sell that stuff, so hopefully in the process they will get some more (and better) variety... something other then just the new "Portland Pilots" text/logo centered on the front. totally agreed PilotNut, what I wouldn't give for a University sanctioned "soccer scarf" and a larger variety of sweatshirts! I dont understand the marketing strategy... If you roll out a new log, it seems to me you would want to "flood the market" with new options, variety, etc... capitalize on the excitement and "newness" by selling a bunch of clothing, etc... The selection really isnt any better than the atrocious (and quite frankly embarrasing) stuff available for the past 10 years or so. Nike was heavily involved in the development of the new logo... and they make some GREAT stuff for other schools... I cant believe they are real happy with this lack of variety/interest, either...?? Just a guess, maybe gear like this costs athletics more, and they don't/can't spend the money. Exactly my point on all three examples, PPT. Especially that first polo shirt... I know some of the UP coaches have that shirt... but it is not available to everyone else. As far as money... no way. Merchandise is a big money maker for schools (or is supposed to be, anyway)... But you have to have a palatable product to sell and license to others to sell. I really dont get it, and this has always been a hot button with me. It's Marketing 101 stuff here, not rocket science. Alright - so I have seen the athletics polos around a few places - even on people in South Bend!! It's obvious that some people have access to them. Has anyone been to the Chiles Center to see if they are available for purchase from the athletic department. If I remember correctly, they have a small shop in there. I for the life of me cannot comprehend why the UP Athletics staff has not embraced the Soccer Scarfs. I mean they ARE soccer culture. I don't understand Tricia being upset with people buying a product that the UP doesn't even offer. Now pardon me while I step down off of this Soap Box. NOTE TO UP SPORTS MARKETING WE WANT UP BRANDED SOCCER SCARFS, IF YOU DO NOT OFFER THEM, WE WILL GET THEM ELSEWHERE... THANK YOU FOR YOUR TIME! I stopped by the bookstore last week, and I have to say that they are making some progress... the apparel was better, the "other" stuff (bumper stickers, blankets, etc) were much improved. The girl working there said that they had a bunch of new t-shirts & shirts for this year, but they hadnt put them out yet, due to a lack of space during the current textbook madness/start of semester rush... but she thought that they would be out in time for the first game (and at the game). Has anyone been to the book store in the past couple days? Well, the real problem is that because the logo and wordmark are Trademarked, you need to be a licensed vendor to be able to use it. Hence the problem with someone (as well intentioned as it may have been) using the logo and making a profit off of it. I think at this point the only places available to buy UP gear are the bookstore and Nike and big chain stores that probably never carry UP stuff anyway. One of the reasons they went through the whole logo change was to get that control, and I think maybe that is still being felt out. Also, I wonder if part of the frustration is that the market for stuff likely isn't huge, so it might be tough to get Nike to really invest a lot of time designing and creating apparel for UP. I don't know though - I may be totally making that up. The way I look at it... the bookstore needs to step up and get better stuff. It's not really on the athletic department. But all they really have are the same-old same-old T-shirts and sweatshirts. The best thing they had last year were those soccer track jackets, and those things sold like wildfire. You'd hope they would realize that some better designed stuff would equate to better sales. Honestly, all I really want is a white-and-purple ringer T-shirt with the logo in the middle; a track jacket that DOESN'T have the gold; and a gray zip-up hoodie with a purple Portland Pilots on it. That gold tertiary color still boggles my mind.... Silver I would understand, but gold?? There is little demand for the apparel because the supply (lack of selection and boring & bad designs) has been attrocious... but how can you build any demand, when the supply is so bad?! This is Marketing 101, not rocket science, and I just dont get it. The University is leaving so much money on the table! ! ! Maybe the bookstore (and/or Athletic Department) could enlist the help of someone in the Business School...?! adidas never had a problem providing...I'm just saying. Nice! I still have one of those scarves too, KFTC! As for the Gold... it actually was the first color of the school waaaaaaay back in the day. I think the idea was to harken back to that and since purple has always been the "royal" color it makes sense to compliment it with gold trim. And actually, I think the women's soccer jerseys with the gold looked really sharp last year. But all in all I agree... I really only like it in very small doses. But the bookstore went hogwild with the gold and splashed it on everything. Our colors are still purple and white - the gold is just meant to be used as an accent color on jerseys and letterhead and stuff like that. Nice to see you back in here KFTC btw... been away from the boards for a while? yeah, i've had a busy summer. not much time to mess around on the internet. now, i have WAY too much time to do so...not sure if that's a good or bad thing yet. 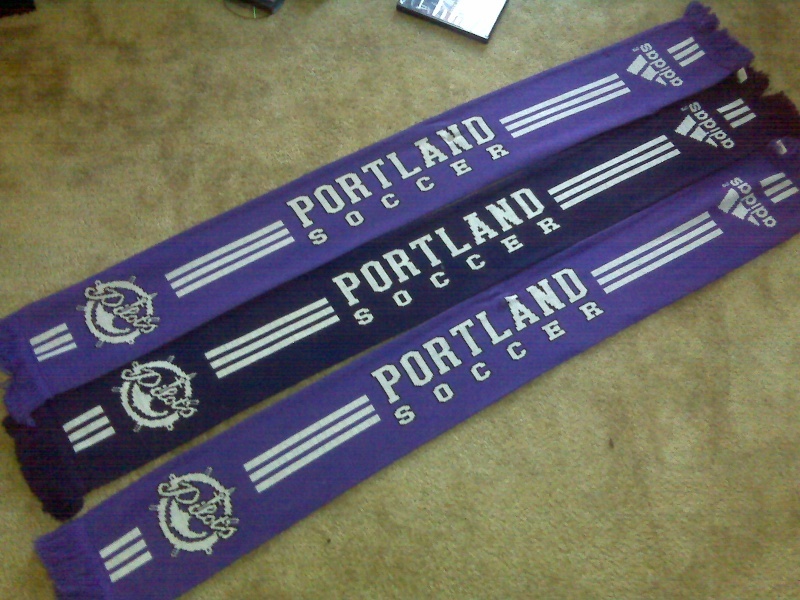 That is what I am talking about... that would be so Awesome, or Scarves that Said Portland on one side and Pilots on the other in solid purple. Regardless what they look like... we need them. Somebody tell whoever's in charge to hurry. I'd love to rock some official gear when I make the trek up to the Rutgers and Penn State games. It'll be my first time seeing the Pilots in person. First time to see the Pilots in person? Wow, that should be awesome, and you should NOT be disappointed. Haha yeah, as long as you find something... anything purple, its all you need!! !